Hot Springs also has some fun events planned for Valentine’s weekend. “Crossing Delancy” will be performed at The Pocket Theatre on 2/12-13 at 7:30pm, and 2/14 at 2:30pm. Reign Down will perform with special guest Housed of Holy (a tribute to Led Zeppelin) at the Central Theater on 2/13 at 8pm. Eagle Watch tours will be held on DeGray Lake 2/13 at 2pm, and on Lake Ouachita 2/12, 2/13, 2/14 at 2pm. Lake Ouachita will also be participating in the Great Backyard Bird Count on 2/13. 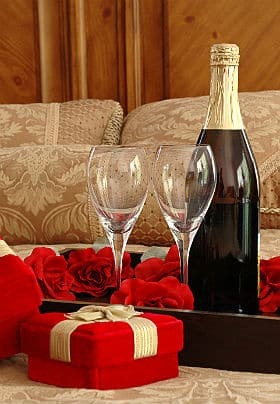 If you can’t make it to Hot Springs on Valentine’s Day, surprise your love with a Tiffany’s Bed and Breakfast gift certificate. Last-minute shoppers will rejoice in this option, as you can print the certificate yourself as soon as you purchase! We look forward to helping you plan your special getaway to the Hot Springs area! This entry was posted in bird watching, packages by admin. Bookmark the permalink.